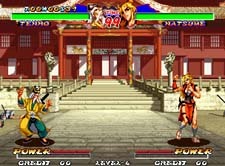 While many of the great games on the Neo Geo have been ported onto other systems, there are a select few that remain Neo Geo exclusives. Of these titles, there are two that top the list of must play titles; one of these is Kizuna Encounter, the other is Ninja Masters. 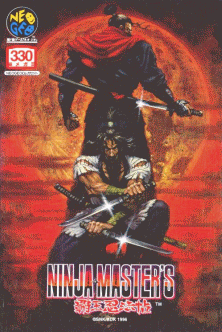 Ninja Masters has quite an easy game play system, which doesn't take too long to learn. The A+B buttons are used for punches/weapon attacks, while C+D are used for kicks. The fighting system is actually a lot deeper than it might seem at first though; it may be easy to get used to, but it will probably take you some time to master its finer details. One of the most interesting things about Ninja Masters is that although it's a weapons based fighter, you don't even have to use your characters weapon if you don't want to; in fact, many of the characters don't even start a fight with their weapon(s) drawn. Certain combos and special moves work differently depending on whether the fighter is using their weapon or not. For example, Goemon carries a huge gun - if he doesn't have the gun in his hands and you perform his projectile attack, he will roll a spiked metal ball at you. If you do the same move when he has the gun in hands however, he shoots a different projectile attack out of it. Being able to put your characters weapon away and fight without it might seem like a bit of a novelty at first, but it does add a bit more depth to the game play. You can lose your weapon if you get stunned too, so you'll need to get used to the different moves your character does with/without their weapon. 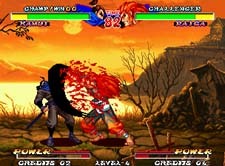 I found that some characters actually fight a bit better without their weapon though (a good example would be Natsume). 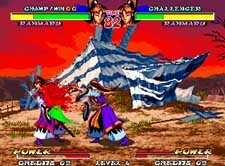 It's a bit more advanced than the system in games like Samurai Shodown for instance, where the only real moves you do when weapon less are simple punches/kicks. You can pick your weapon back up though by standing next to it, ducking down and pressing B+C together. There is no run command in this game, but you can dash slightly by tapping forwards or backwards twice. 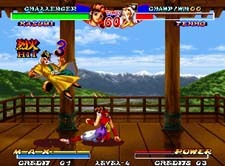 If there is one phrase that I can use to describe the majority of the combos in this game, it would be "Dial a combo". If you aren't sure what I mean by this, the best example I can think of is the sort of combos found in games like Mortal Kombat 3... where you run in and press a set combination of buttons to do a particular combo, which is a lot like most 3D fighters. 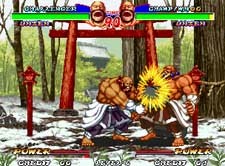 While it is true that the dial a combo system means that even a total novice could play the game and just button mash to pull off some impressive looking moves, the game can still be played skilfully if you take the time to learn your characters combos properly. This is the sort of thing that people either love or hate... if you hate this kind of system, then the chances are high that you are not going to like Ninja Masters. 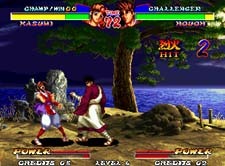 Each character has a special move that can be repeated a few times in quick succession for more hits. For example, Sasuke's uppercut can have some extra hits added to it - after you perform the joystick motion for this move (F, D, DF + P), quickly doing QCF + P twice right after it will make Sasuke punch his opponent a few times before doing the move. This will do a fair bit more damage, however your timing has to be very good for the move to be successful. All the other characters also have moves that can be "pumped" in this way; see the FAQ's/moves lists for more details. Unleash a powered up version of certain special moves: These are done by pressing both kick/punch buttons when you do the move instead of just the one. For instance, if you do Sasuke's projectile, pressing A+B (weak/hard punch) together will make him throw a more powerful shuriken than the normal one. 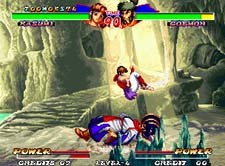 Perform a "super combo": all characters have one or two super combos, which are performed with a set pattern of button presses, just like any other chain combo. However, these can be devastating if they connect, and take off a lot of energy (and some look very cool ;). When you perform one of these, the power gauge will drop back down to zero. While Maxed out, pressing A+B+C will put you into "Hyper mode". Activating this will knock down your opponent if they are close by, but it will not cause them any damage. While in Hyper mode you will be able to perform your characters desperation move. Once hyper is activated, the power gauge will slowly start to drain down. You can still perform powered up special moves and super combos in hyper mode too. While in hyper mode, you will have a blue after image trailing your character. These can be done once when you are in hyper mode (after performing them the power meter will go back to zero), or as many times as you want when your life bar is low (flashing). These can be done when your opponent's life bar is flashing red *and* you are maxed out. If this connects, it will finish your opponent off, as the name suggests. They can also be performed at any time provided you are in hyper mode, although they wont finish off an opponent if done at this time. Here's a rundown of all 12 characters (2 are hidden bosses), as well as some details about their stage. One thing to note is that all of the stages have a couple of versions that are set at different times of the day. These appear randomly as far as I know. Note: I got some of the information about each characters background from Ket's Ninja Masters FAQ as I wasn't 100% sure of everyone's story. As far as I know it is all correct, but please correct me if I am wrong :). Thanks go out to seiryu for pointing a few storyline related things out to me! After completing his Ninja training very quickly Sasuke left his clan to defeat Nobunaga, and because of this he is now being hunted down by assassins for breaking the Ninja code. 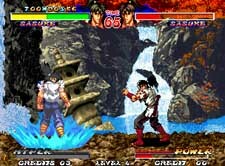 Along with Kamui, Sasuke is best described as the "Ryu/Ken" character of Ninja Masters, and has the usual "shoto" moves (fireball, dragon punch etc). He fights with a pair of cool looking short swords, although he starts every fight without them. You can add a LOT of extra hits to his Dragon punch move by doing QCF + P immediately after performing the motion for this move. In my opinion, this is the best-looking stage of the game, with some really nice waterfalls in the background. It is also accompanied by some amazing music - it's probably the fastest paced piece of music in the game and it really goes well with this stage. 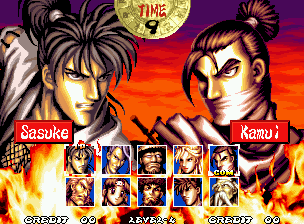 Kamui trained with Sasuke and is his rival and friend (hence the comparisons to Ryu and Ken from Street Fighter). Since Sasuke broke the Ninja code and left their clan, Kamui is pursuing him to give him an "honourable death", in accordance with Ninja Law. While Sasuke fights with twin short swords and doesn't start each match with his weapons drawn, Kamui always starts a fight with his single sword out. His super combo takes off almost half an energy bar and does 28 hits, and his desperation/finishing moves look very cool! His moves are sufficiently different enough to distinguish him from Sasuke. Kamui's stage is set on top of a bride over a large stretch of water. 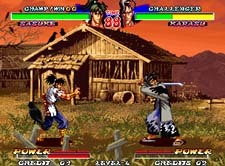 If a fight reaches the 3rd stage, it begins to rain. It's quite a bland-looking stage really, but somehow it still manages to be quite cool and features some fairly minimal (but still great) music. Karasu is a wanderer who travels around working as a bodyguard. He is a cool as hell character (probably my personal favourite in fact), who seems to have a fondness for crows. In fact, the word "Karasu" actually means "Crow" in Japanese. His sword is also kind of interesting and seems to have supernatural powers - when he puts it away it just kind of sinks into the floor, and during his super combo it flies around on its own, slicing up Karasu's opponent. 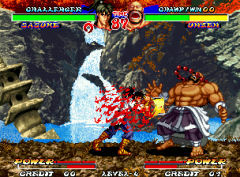 He has a projectile where he fires a crow from out of his chest; if you tap forward, forward punch (can be done twice) right after performing the motion for this move, you can unleash up to 3 crows for extra hits. Also, if you drop your weapon, pressing forward and A+B will make the sword turn into a crow and fly back to you - it will land on the floor next to you so that you can pick it up. Very cool, although it isn't really that much use during a proper fight as it happens quite slowly. Natsume was born and raised in a tribe with foreign blood. After being troubled by terrible nightmares for some time, she finds that the cause of these nightmares originates in Japan. Natsume is the closest Ninja Masters comes to having a "Mai Shiranui", as she is... well, for want of a better way to describe it, a little "bouncy" (but nowhere near as much as Mai herself ;). She is a good character, and she has some quite damaging combos that are easy to pull off (a friend of mine described her as cheap actually). Some might call her a "shoto" too, as she has an uppercut, projectile and hurricane kick style move. However, her projectile requires that she is holding her weapon and can only be done once as she actually throws the weapon at her opponent, although you can pick it back up and do it again of course. Natsume's stage is a courtyard which looks to have been the scene of some kind of battle, as a number of dead bodies litter the floor. This is a ok stage with some decent music. Unzen is normally a kind-hearted guy, but unfortunately he is prone to violent rages when he gets drunk. This leads to him getting kicked out of the temple that he entered for training. Because of this, he has hidden himself away in the mountains so that he can continue training on his own. Tenho is the obligatory "wise old man" of this game. He grew up in Hong Kong and trained as a Taoist Monk. Tenho sensed that something was wrong in Japan and decided to leave his family to find the cause. I like Tenho's character a lot, as he reminds me a little of an older version of Lam Ching-Ying's character from the old HK movie "Mr Vampire" (who was also a Taoist Monk) and he has a whole host of cool moves at his disposal. He has a cool super combo that does 24 hits (with only 5 button presses), although you have to be quick with your fingers to pull it off. Tenho's isn't the most memorable of all the stages in this game, but it is still pretty damn good. One thing that I definitely like a lot is the atmospheric music here, which starts off slow but then speeds up a bit. It suits the stage very well and is one of the most memorable tunes in the game. Goemon is a character loosely based on Japanese history, and is pretty much a Japanese version of Robin Hood, who steals money from bad people to give to those less fortunate. 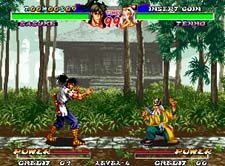 He is being hunted down by Raiga (see below). He carries a massive gun, which he takes delight in smacking his opponent over the head with, as well as using it to shoot projectile attacks. Has quite a large variety of good (and damaging) moves. Goemon's stage is set inside a cave and is another of my personal favourites. It looks very nice, is well detailed and has some really cool music. Raiga is a well-known bounty hunter who has been pursuing the thief "Goemon" for many years, but has never been able to catch him. 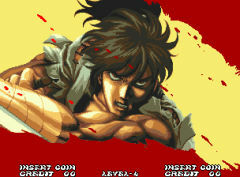 Raiga is pretty much a grappler and many of his moves involve some impressive looking throws. He isn't the easiest character to use, but I found playing as him quite satisfying once I got used to it (and I'm not usually a fan of grapplers). He doesn't start each match with his weapon drawn (large knife), but he can do some nice combos with it should you choose to use it. Raiga has a nice looking stage with a couple of buildings in the background and some water. The sunset version of this stage looks nicer than the daytime one. The music on this stage is ok, but it can get really repetitive after you have been listening to it for a while, although you won't notice it too much while you are fighting. Houoh is a spiritualist who was born with the power to expel evil, but ironically this power also attracts demons. He hates demons as they killed his parents when he was young. His main specials are charge moves, so he is probably better as a defensive character than an offensive one. Has low and high projectiles and an whirlwind uppercut move that is done by charging down then pressing up and punch. I don't play as him much, but he seems like a reasonable character to use. Houoh's stage is really nice to look at and is usually set under the moonlight. The music here suits the stage very well and is good to listen to while fighting, but it can get a bit annoying after a while. Kasumi is the 16 year old granddaughter of the leader of the Kurenai clan. Although she has not undergone full training yet, she is still a very strong fighter. She left home to eliminate the source of the bloody battles going on throughout Japan... or was it just because she wanted to escape from the strict training? Ninja Masters is quite a dark game, so Kasumi sticks out a bit from the rest of the characters as she is really the only "cutesy" character in the game, although she isn't so cute that she becomes annoying. That doesn't mean you should underestimate her though as she is stereotypically fast (like most female characters) and she has some decent moves. This is another character I don't play as much though. In my opinion, Kasumi's stage is the worst looking of all the Ninja Masters backgrounds. It isn't terrible, it's just very plain and flat looking, and the only real animation on this stage is a handful of birds flying around in the background and some trees in the background blowing slightly. It would have looked much better if there was some more detail, or perhaps a little parallax scrolling to make it seem a bit less flat. The version of the stage at sunset looks a little bit better. Still, the music on this stage is fairly decent. Mori Ranmaru is said to have been a follower and advisor of the warlord Nobunaga Oda. If you look up some Japanese history, you will find that Nobunaga and Ranmaru's relationship probably went further than that, but that isn't really related to the game so I won't talk about that too much. Suffice to say, it may surprise you a bit! We have all seen some very feminine looking male characters in fighting games before, but Ranmaru is probably the most feminine looking man I have ever seen (yes, it IS a man :). 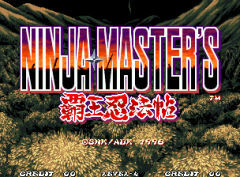 The first time I played Ninja Masters I did actually think it was a woman, until someone informed me otherwise.I don't know if anyone else has ever noticed this, but Ranmaru's voice sounds a little bit similar to Himura Kenshin's (from the anime Rurouni Kenshin). I know it isn't the same actor/actress doing the voice, but it does sound similar to me. Being the sub-boss of the game, Ranmaru is a very powerful character with some great moves; he even fights with his eyes closed... now THAT'S what you call tough! He has a projectile, a 3 hit teleport kick combo, a cool super combo where he drains some energy from you and uses that energy to send you flying across the screen, and great desperation/finishing moves. I especially like his finishing move - he actually cuts off his own hand and sends it scurrying across the floor towards his opponent. When it reaches them it turns into a big hand that shoots upwards and causes them some major pain. Another nice effect is when Ranmaru drops his sword after being stunned; it turns into a snake and follows him around until he picks it back up. 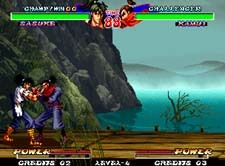 All good boss characters need a suitably cool stage for you to fight them on, and thankfully, Ranmaru's IS a cool one. Your fight with him takes place on what was obviously the location of a recent battle as there are some abandoned weapons on the right side of the screen. There's also a tent in the background blowing in the wind, which is a nice effect. There's a daytime version of this stage as well as the more common evening one. I prefer the one with the red sky though as it looks better, and the red sky makes the water seem blood red which is kinda cool. Nobunaga Oda is loosely based on a real person from Japanese history, which is why there is also a version of Nobunaga in Capcom's game "Onimusha" along with many other games/movies. His goal was to unite the country of Japan under one sword, and in this game he has struck a bargain with some kind of demonic powers to achieve that ambition. He has a very cool looking cape that seems to be alive... check out the win pose where he opens up his cape and you see that it is inhabited by some demonic creatures. 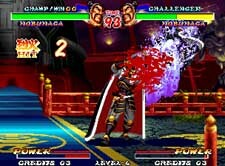 Nobunaga is the final boss of the game and as you would expect he is a very tough guy, although he is a much better developed character than many final bosses in Neo Geo games. He is the only character that cannot fight without a weapon - he normally fights with one sword, but pressing B+C makes him pull out a 2nd fire sword. His 17 hit desperation where he throws his second sword at the enemy is cool, as is his finisher where the cape swallows his opponent up and then sends them crashing down from the top of the screen with a trail of blood following... I guess the aforementioned demons in the cape decided to have some fun. Nobunaga fights in a large palace with some big statues in both corners of the screen. This is a very well drawn stage with some fitting music, perfect for your confrontation with the final boss. Click here for page 2 of the review!